Actually, its not a taco. Its a “sandwich” — according to Noodles & Company, anyway. Psssh. What does a noodle shop know about sandwiches? Apparently enough to make a super delicious Spicy Chicken Caesar sandwich (that resembles a taco). A co-worker has me hooked on these tasty creations. 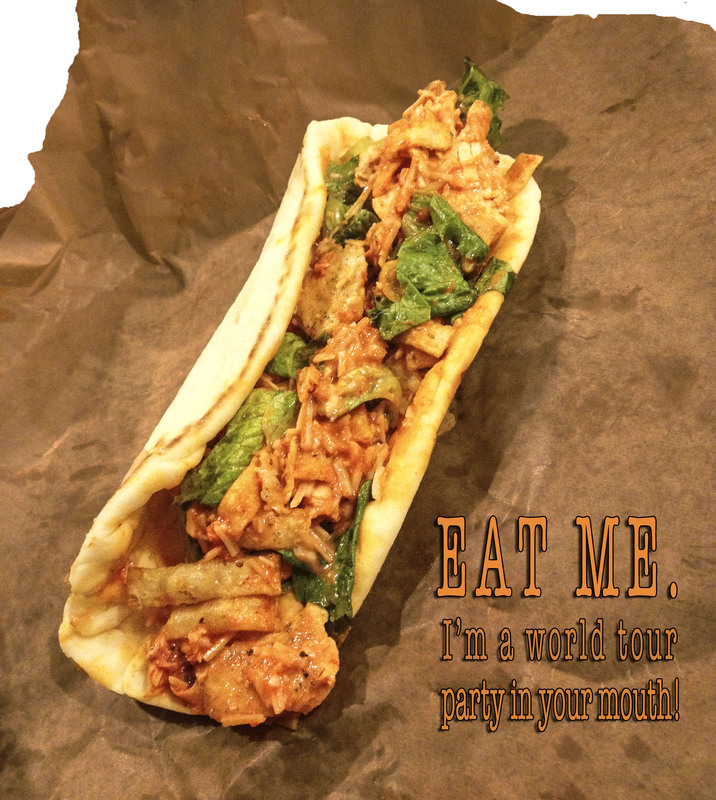 Think: Flatbread stuffed with Caesar salad and chicken doused in Sriracha. And throw in Parmesan cheese and some wonton strips for added crunch. Jeez. When you think about all of the components and shape, its kind of like a Mediterranean-Italian-Thai-Taco-Sandwich. A definite tour of the world in your mouth. Hmmm. Interesting. 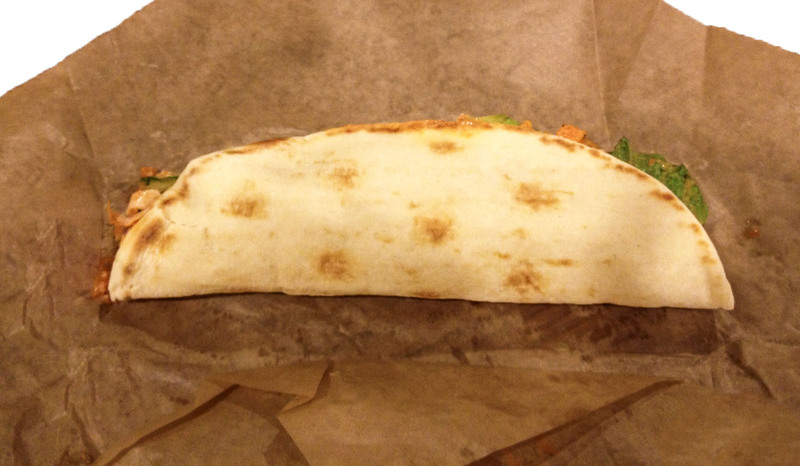 The above specimen is bread-like (sandwich) but its also folded (taco). Hmmm. Okay, so that is more like it. Not totally like it, but more on target than Urban Dictionary. Sweet Baby Jesus. I wish I had come up with the term TLO. I love it. 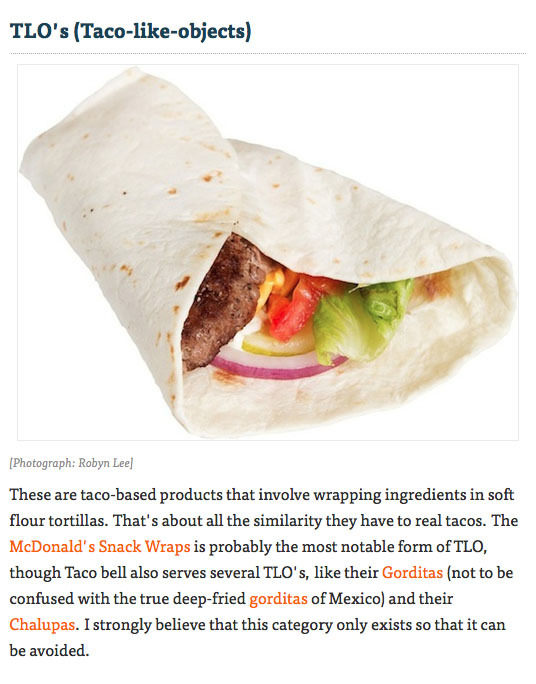 I also partially agree with the TLO creator that the category exists only to be avoided, mainly because they reference McDonald’s wraps in their definition… and wraps from Mickey D’s gross me out. (Add that to the list of things that gross me out.) But I can not (and will not) avoid the TLO at Noodles & Company. So, having gone through all of this…. I have decided after much research, personal experiences eating both sandwiches and tacos and, most importantly, my own opinion that the World Tour Taco [Sandwich] does, indeed, qualify as a taco. Happy Taco Tuesday, wherever you are in the world. This entry was posted in On the Web, Taco Tuesday and tagged Caesar Salad, Chicken, food, humor, italian, Mediterranean, Noodles & Company, photography, Sandwich, Sriracha, Taco, taco tuesday, thai. Bookmark the permalink. Tacos ARE sandwiches. But not all sandwiches are tacos. I’ve thought of that with every single Taco Tuesday post. Think of it as the food equivalent of “all squares are rectangles, but not all rectangles are squares.” If you wanted you could just repost today’s entry on Saturday for Sandwich Saturday. I’m feeling very helpful today. 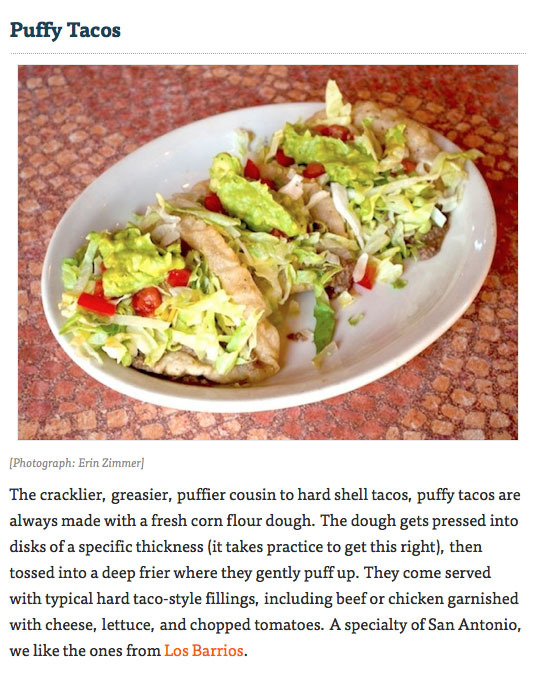 The “puffy taco” comment (and I mean the food part) is similar to Navajo fry bread. Check it out if it isn’t something you’re familiar with already. Hahaha! Thank you for clarifying 🙂 I have never had Navajo fry bread. I will definitely have to try it!!! Thanks for the comment! I believe Navajo fry bread is similar to something your great grandmother used to do when your grandmother was a child. 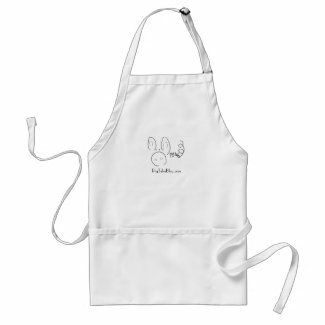 My Grandma made bread 3 times a week, several loaves each time (there were 5 children, so lots of bread). Before she baked the first loaf she would pinch off a piece of the dough, flatten it between her fingers and deep fry it to test the dough. If her children were home on bread baking days she would do this with multiple pieces of dough because they loved it with jelly. A few years ago Jim had a party at his house where they set up tables and deep fryers outside and fried hundreds of disks of dough. Grandma and Aunt Laura talked about it for weeks. Can’t remember what they were called but Aunt Laura and I talked about this just a month or so ago.